Always the 1st to support latest DVDs. Buy Lifetime License, enjoy Lifetime Free Upgrade. Accept payment in USD, EUR, GBP, AUD, etc. The program has a simple, straightforward interface, and in my experience it works as advertised. WinX DVD Copy Pro is perfect for backing up your discs, even if they've accumulated scratches. Remove Trial limit and use all features. Backup DVD with intact quality. A must-have for physical disc collectors. Rebuild library with ease. The most powerful DVD tool that supports any tough discs. If you have any problem on placing your order, please call our online payment processor 2Checkout for instant help. WinX DVD Copy ProMake 1:1 DVD backup. 9 DVD copy modes. 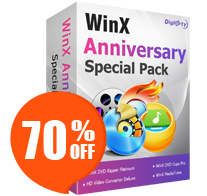 WinX DVD Ripper PlatinumDVD to MP4, ISO image, iPhone, Android, etc. WinX MediaTransTransfer and manage iOS files. Without iTunes. VideoProc Convert, resize, edit - versatile video processing tool. ● For 1-year license: You need to re-order the product after your subscription expires. We do not provide auto renewal. ● For Lifetime License: You enjoy unlimited upgrade to any future version with major or minor improvement. ● The associated Setup File Link + License Code will be sent to you by email immediately. DVD Ripper – Digitise DVD in 5 min to MP4 H.264 WMV iOS Android, etc. Customize output, subtitle, crop, trim and merge. DVD Ripper - Digitise DVD in 5 min to MP4 H.264 WMV iOS Android, etc. Customize output, subtitle, crop, trim and merge.